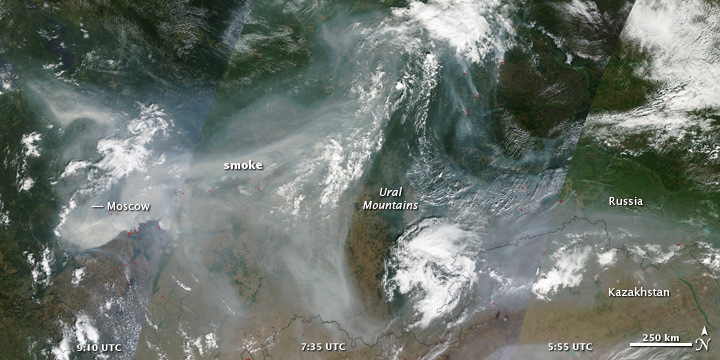 This post is a meta-commentary on media coverage of Russia’s drought and wildfires. 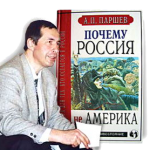 Now make no mistake, I admire the yeoman work of some journalists in covering Russia burning: no doubt a few will even make their way into the classical cannon such as The Saga of the Burned Foot (Miriam Elder) or The Tale of How Aleksandr Pochkov Quarreled with Vladimir Vladimirovich (A Good Treaty). 🙂 But in my opinion, they almost all fail to consider the key facts that render their Kremlin criticism moot and fail to grasp the “big picture”: the Great Russian Heatwave of 2010 as a mere herald of things to come. 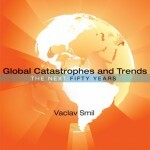 In summary: 1) There is nothing the Russian government could have done to contain a natural disaster of such magnitude, 2) many of the lectures about how Russia could have done better to prepare itself would have been counter-productive had they actually been implemented, 3) the hysteria about Moscow turning into a giant morgue from heat stress and smog or radioactive ash clouds is overblown, and 4) the real problem, or rather predicament, is global warming, the effects of which are expected to transform Russia’s heartlands into Central Asia within the next few decades. A strong argument could be made for calling this disaster Putin’s Hurricane Katrina. In 2006, then-President Putin, in consultation with the Russian timber industry, “reformed” forestry regulations, eliminating positions for rangers, making each of the remaining ones responsible for more territory, increasing paperwork so they spent hardly any time outdoors monitoring the forests—and, on the off chance that they did spot a small fire while on patrol, making it a punishable offense (a misuse of state funds) to put it out. So assume that the Kremlin had listened to forestry expert Ioffe, and restarted the Soviet practice of forest fire suppression whenever they sprang up. That would have solved the problem, right? No. It would have made it a lot worse. Left alone, forests experience small, contained fires every few years, which clear out excess undergrowth, replenish the soil and maintain the resilience of the forest ecosystem. But as soon as you start playing Canute to the woodlands, layers of dead biomass accumulate on the forest bed. Eventually, it reaches such a critical mass that the next heatwave is bound to create a conflagration, made catastrophic of the interventionist’s own hubris. If Russia’s leaders stay remote and aloof from their subjects, they’re cold and indifferent. If they make any attempt, even one that looks suspiciously scripted, to connect, they’re Janus-faced Tsars. Dr. 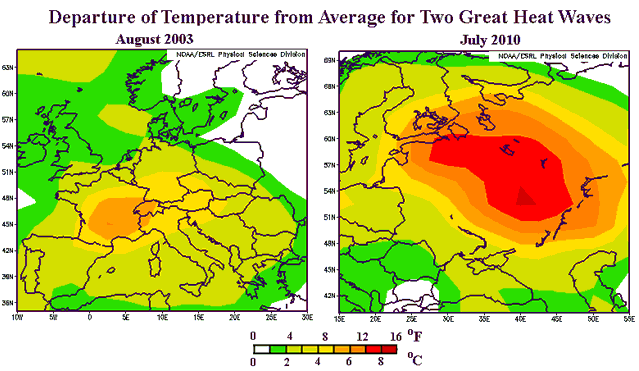 Rob Carver has done a detailed analysis of the remarkable Russian heat wave in his latest post, The Great Russian Heat Wave of July 2010. A persistent jet stream pattern has set up over Europe, thanks to a phenomena known as blocking. A ridge of high pressure has remained anchored over Russia, and the hot and dry conditions have created helped intensify this ridge in a positive feedback loop. As a result, soil moisture in some portions of European Russia has dropped to levels one would expect only once every 500 years. Furthermore, consider the vast territorial extent of Eurasia’s drought. In retrospect, the current death toll from the fires, at 50, might well be remarkably low, considering the extreme circumstances (compare with 173 deaths in the Black Saturday bushfires last year in Australia, a country Russia’s critics would all consider “civilized” and developed). But what do I know? According to Julia Ioffe and Foreign Policy, forest fires only happen in countries with non-liberal Presidents. Two rather hysterical stories doing the rounds. 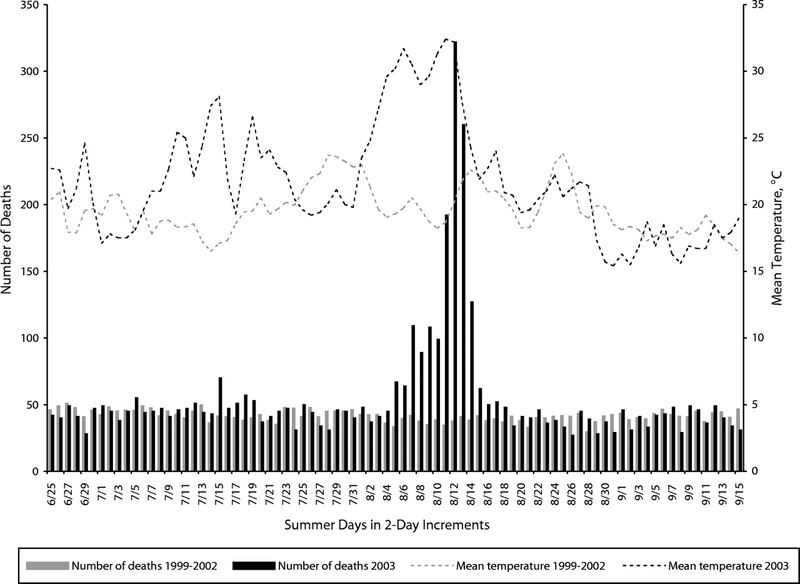 Make no mistake: premature deaths from heat stress are tragic. Moscow’s mortality rate rose by 29.7% in July 2009, relative to the same period last year. August might be even worse if the searing temperatures continue into next week. The morgues are overflowing, with the numbers of daily deaths multiplying by 2-7x over normal in recent days (the sources differ). But this does happen when record-breaking heat waves strike, anywhere. I was unfortunate enough to be in Paris during the 2003 heatwave, when temperates hit 40C and more. It was a torrid hell of heat and concrete: I remember taking several cold showers per day and avoiding sun-drenched spaces like a vampire. But I had it good. People with pre-existing medical conditions were dying early. The French capital observed a 142% mortality increase in August 2003, with deaths spiking to 2-8x their normal levels during the week of the heat wave. But at least Parisians are more used to hot summers and didn’t have to contend with the smoke. Neither can be said for Muscovites. So a high number of excess deaths – estimated to reach 40,000 by Jeff Masters – is regrettable, but to be expected. What about the fires releasing radioactive ashclouds from the areas around Chernobyl? Pure hysteria. Even if the inferno spread there, the radioactive particles released in 1986 have long since become diluted in the environment. Rinse and repeat if taken on an airborne ride by the fires a second time. Most commentators prefer to spend their time discussing Putin’s ownage of the Sovok citizen blogger or the destruction of the naval aviation storage base that spawned a firestorm of blame and recriminations. It certainly doesn’t shed a good light into the nefarious workings of the Russian bureaucracy (few things do), but guys, this is largely irrelevant. What’s really significant is that this once-in-a-century (or is now once-in-a-millennium?) drought is a symptom of global warming, a few more degrees of which will transform the Russian heartlands into Central Asia. 1. The collapse of Russia’s grain production, estimated to fall from 100mn tons in 2009 to just 65mn tons this year. This is huge. It reverses practically all the agricultural revival (in volume output) achieved in the past few years, bringing Russia back (maybe even below) its post-Soviet agricultural nadir. Furthermore, the depression may continue for another two years, if the earth is baked too hard for sowing the winter crop: a nation accounting for 25% of the world’s wheat exports will be out of business for two years. Coupled with agricultural decline in other countries (e.g. floods in China to reduce its rice crop by 5-7% this year) and rising food protectionism, social welfare in poor food importers like Egypt and Pakistan will plummet. The conditions aren’t in place for a repeat of the 2008 food crisis, but this does confirm that our age is now one of increasing scarcity. 2. This year is unprecedented everywhere: it is the hottest July on record (and the hottest year on record). Thermometers have been snapping left, right and center as new temperature records are set from Belarus to Sudan. The Arctic has given up the ghost, with sea ice volume plummeting into oblivion. This is despite the fact that we are at a periodic, deep minimum in solar irradiance. One can only imagine the kind of havoc we’ll see in 2012-15 as it bounces back to its maximum. And that’s not all the bad news. The Russian fires will have burned an unholy amount of biomass, which is even now making its way into the atmosphere in the form of CO2. Historically, heatwave years are associated with above-average increases in atmospheric CO2 as the carbon cycle reverses direction. It is not impossible that 2010 will be the first year in which atmospheric CO2 increases by more than 3ppm (the previous record was 2.93ppm in 1998, a scorcher year that saw massive peat bog fires in Borneo). The general agricultural and climate crisis is the context in which Russia’s wildfires must be framed. 3. The extent to which Russia benefits from global warming surely ought to be reassessed. Most climate models predicted a moderate increase in agricultural output on the cold Eurasian steppes with up to 2C of warming, making up for declining yields in the mid-latitudes and tropics. These assumptions might have to be reassessed if Russia’s Black Earth metamorphoses into a Dust Bowl. Though mass migration to the Arctic is a possible (and probably inevitable in the long-term) adaptation, it needs generations to be effected. The preparations have to begin now. The sooner Putin and Medvedev realize this, the more favorably history will judge them; minor things will be forgotten. (I intend to write a post on Russia’s future as an Arctic civilization sometime in the next few weeks). 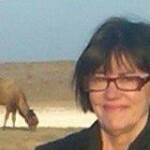 Russia is unlikely to ever have problems feeding itself, as long as its agricultural policies remain more or less sane. Nonetheless, its massive drought (which may become the norm rather than the exception sooner rather later) and grain export ban indicate it’s unwise to rely on it to bring big food surpluses to the global dinner table in the next few decades. UPDATE, August 10: So it really is not just a one in a hundred years but a once in a thousand years event: Russian Meteorological Center: There was nothing similar to this on the territory of Russia during the last one thousand years in regard to the heat. Kathy Lally Didn’t Get Any Flowers Today. How Sad.